ConceptDraw DIAGRAM diagramming and vector drawing software with Audio, Video, Media solution is a very useful tool for designing the CCTV (Сlosed Circuit Television) network diagrams. 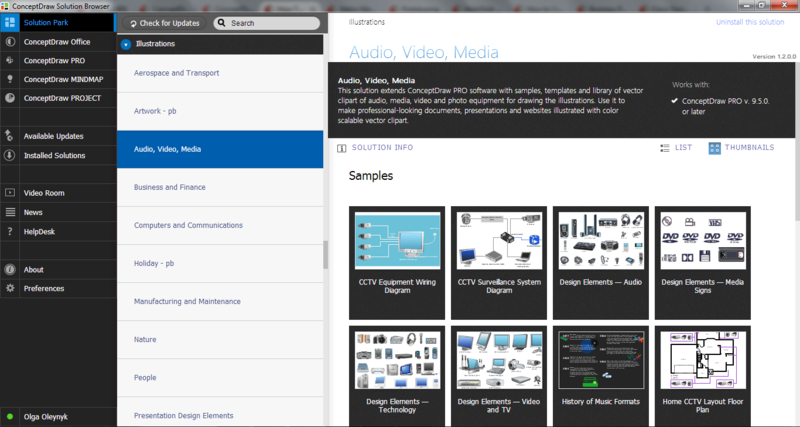 Audio, Video, Media solution from the Illustration area of ConceptDraw Solution Park provides 4 libraries of vector cliparts of video, audio, TV, media and other digital devices that allow you to design the CCTV network diagrams quick, easy and effective. Audio, Video, Media solution of ConceptDraw DIAGRAM provides templates and samples that help you to create the professional looking CCTV system diagrams in one moment. 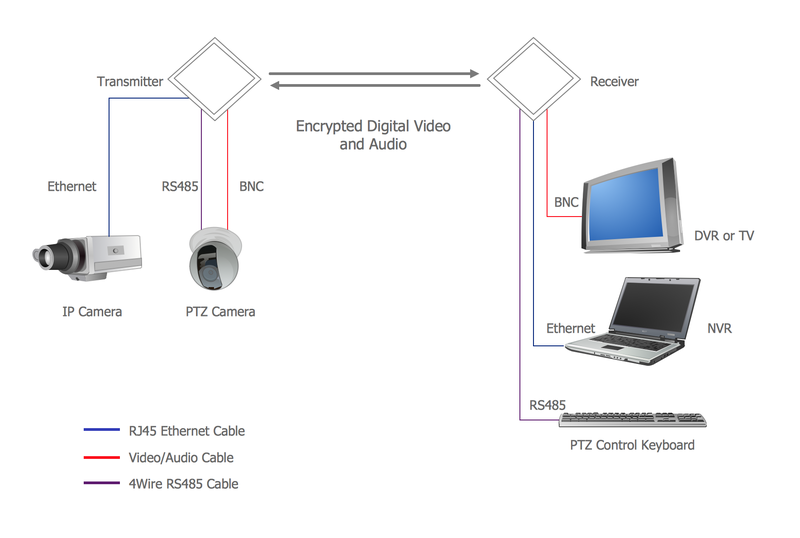 This CCTV system diagram was created in ConceptDraw DIAGRAM diagramming software using the Audio, Video, Media solution from ConceptDraw Solution Park. Illustrate your CCTV system diagrams using the vector cliparts from the libraries of Audio, Video, Media solution. The CCTV network diagrams created in ConceptDraw DIAGRAM using the Audio, Video, Media solution are vector graphic documents. They are available for reviewing, modifying or converting to a variety of formats: image, HTML, PDF file, MS PowerPoint Presentation, Adobe Flash or MS Visio. 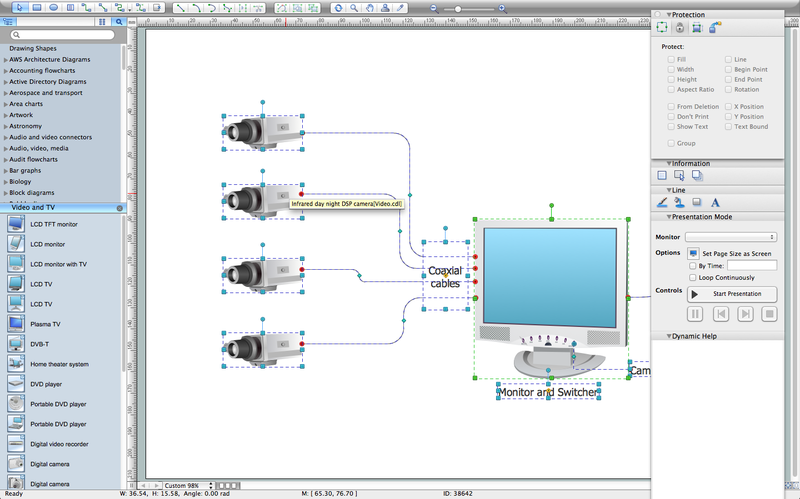 Creating CCTV system diagrams is quick and easy with ConceptDraw DIAGRAM v12 diagramming software enhanced with Audio, Video, Media solution from ConceptDraw Solution Park. It contains library of vector cliparts of video and TV devices and different digital gadgets for drawing this kind of diagrams. No security system cannot be constructed without detailed security plan, or even a set of plans in some cases. ConceptDraw DIAGRAM v12 software offers the Security and Access Plans Solution from the Building Plans Area to help you design the Security Plans for any premises and of any complexity.